It's hockey with a broom and a ball! Broomball is a safe and fun group activity played on a roughened ice surface in tennis shoes. Broomball can be played by up to 30 participants at one time. Snoopy's Home Ice will provide you with all of the equipment you'll need to make your broomball event a success! Broomball is played on Friday and Saturday late nights, subject to availability. To book your broomball event, please contact Sarah, at 707-546-7147 ext. 214 (Sarah@SnoopysHomeIce.com). Players MUST wear a helmet at all times, Snoopy's Home Ice has helmets, but feel free to bring you own. Kneepads, elbow pads and mouthpieces are recommended, but not supplied. Sliding and/or checking are prohibited while playing. Brooms must be kept below the waist at all times. Throwing the stick at the ball or to the ice surface is illegal. 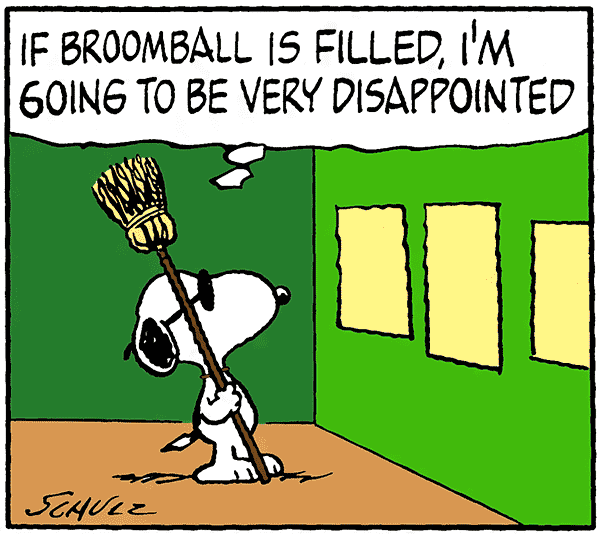 Kicking the broomball is illegal. But, you may use your foot to stop the ball. Broomballs above waist height can be stopped with hands and dropped to the ice. Don’t catch and throw the ball or bring your stick up. The only player who may handle or move the ball forward with the hands is the goalie. The goalie may move the ball forward as long as he keeps it below everyone’s waist. Don’t throw the ball over players’ heads. Stick swinging near the goalie is dangerous and should be avoided.